This study found that there are many interrelated consequences of the economic downturn that lead to both home foreclosure and to homelessness. There is an increased need for affordable housing, as well as targeted legal assistance, health care, living-wage jobs, income supports, access to education, civil rights protections and the various supports that will continue to be needed as a result of the recession. John Parvensky, Board of Directors President for the National Coalition for the Homeless and Executive Director of the Colorado Coalition for the Homeless states, "This report underscores the fact that we as a nation need to strengthen our efforts to prevent homelessness resulting from this economic crisis, while creating sufficient new affordable rental housing to ensure that no family in America has to experience the tragedy of homelessness." 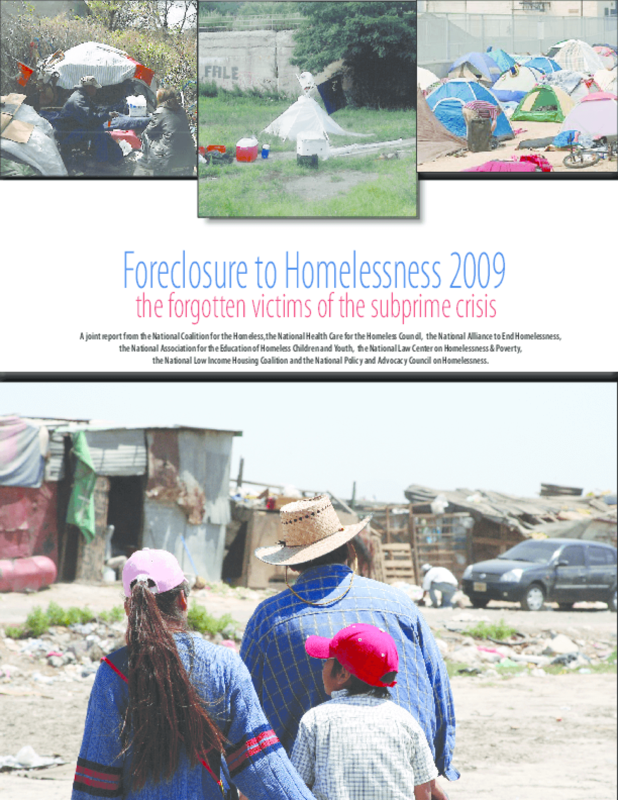 In a national survey of homeless service and advocacy agencies conducted by the these groups, 79 percent of respondents stated that at least some of their clients were homeless as a result of foreclosure, and about half estimated that more than ten percent of their clients were homeless because of foreclosure on a home they had been occupying. During 2008, RealtyTrac reported 3,157,806 foreclosure filings -- default notices, auction sale notices and bank repossessions, an 81 percent jump from 2007 and a 225 percent increase from 2006. "We are one step away from foreclosure. More and more families and children are affected by job loss and the economy. 'Getting back on your feet' is next to impossible in today's society. The public needs to be made aware of who is becoming homeless... and that they could be next - just like any average family," an individual respondent to the national survey from North Carolina reported. Copyright 2009 National Coalition for the Homeless. All rights reserved.